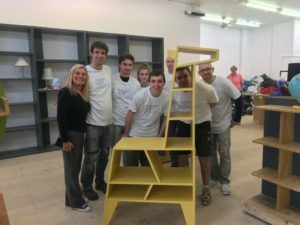 A team from Mander Duffill, swapped a day at the desk for a day of volunteer work, rolling up their sleeves to help a new charity shop preparing to open. In addition to their regular fundraising work for Julia’s House and other local charities, 7 staff members from Mander Duffill also donated their time and manpower to help the charity. Above: The Mander Duffill team with Tracey Stanley from Julia’s House. Replacing calculators with paintbrushes, the volunteers helped to clear out, paint, assemble shelving and move and sort through stock at the first Julia’s House shop in Wiltshire, which is due to open in early November. The new store in Fisherton Street, Salisbury is being completely refurbished under the watchful eye of Tracey Stanley, Julia’s House’ Retail Manager. 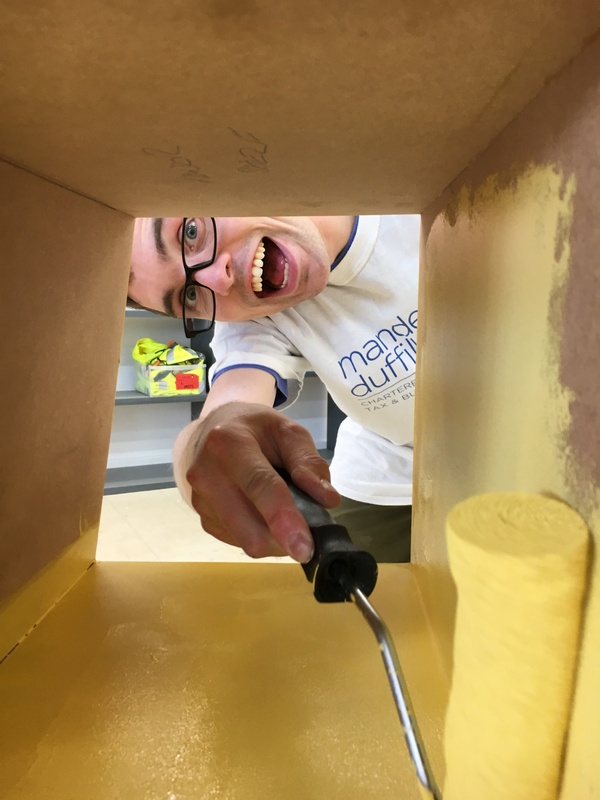 Joe Saunders having fun painting the wooden giraffe. Julia’s House, which is Mander Duffill’s headline charity for the year, has recently opened Wiltshire’s first Children’s Hospice which offers home and community-based respite care to parents with life-limited children. The Salisbury shop will also act as a central warehouse for donations from all over Wiltshire and they are particularly looking for donations of larger items of furniture. If you have any items that you would like to donate, please call 01202 601998 to arrange collection. If you would like to volunteer, Julia’s House runs a key volunteer programme, including a training scheme for those interested in developing the skills needed for a career in retail. For further information about volunteering opportunities, please visit juliashouse.org/jobs.